Sustainable Business Oregon: The UO’s Lewis Integrative Science Building has become the state’s first higher education lab to receive LEED platinum status. Register-Guard: The special edition section of the Register-Guard profiles Jill Hartz, executive director of the Jordan Schnitzer Museum of Art. Texas Public Radio: Prior to Alamo Bowl, the UO participated in the “Fighting Hunger Together” Alamo Bowl service project with representatives from the University of Texas to assemble boxes with more than 15,000 pounds of food. The Atlantic: Interim Provost Scott Coltrane contributed a commentary about a recent study with other UO sociologists about paternity leave. UO News: Psychology professor Elliot Berkman has a new study in the Jan. 1 issue of the Journal of Neuroscience that concludes that “brain training” for a particular task heightens performance, but that advantage doesn't necessarily carry over to a new challenge. Register-Guard: UO’s Richard Chartoff is a recipient of a Gates Foundation grant to design a better condom to improve global health. Celebrating Champions: The University of Oregon met with prospective and current students and families, helped the local community with a service project, and joined alumni to cheer on the football game at its bowl appearance. AroundtheO: More than 1,000 stories were posted to AroundtheO over the past year, and those stories drew a total of nearly 745,000 page views. AroundtheO: UO will welcome international trombone soloist and recording artist Joseph Alessi, principal trombonist of the New York Philharmonic, for a weeklong residency in January at the School of Music and Dance. 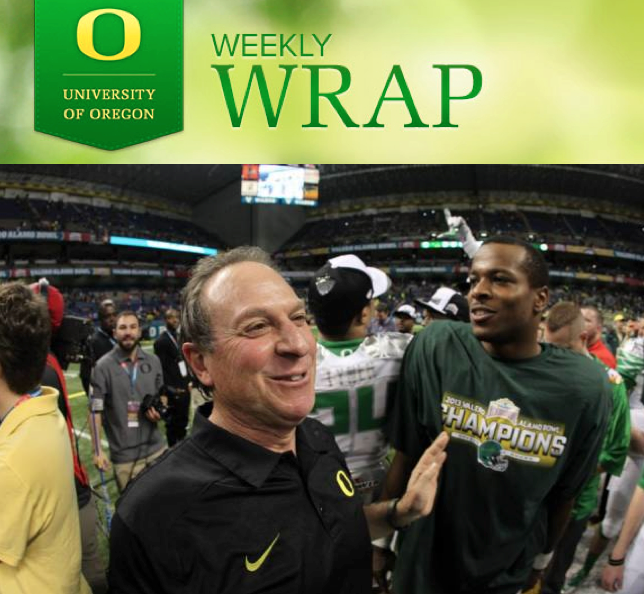 GoDucks.com: Defensive coordinator Nick Aliotti coached his last game at the Valero Alamo Bowl to cap a 24-year coaching tenure at Oregon.